My favorite time of the day is first thing in the morning when I go and get Remy out of her crib. Usually she is just lying there, blowing bubbles and sucking on the sleeves of her sleep sack. The second you pick her up though she will give you the biggest, widest, open-mouthed smile a baby can give someone. It melts my heart into a million pieces and I immediately forgive her for waking up 165 times in the middle of the night. Many times Lola and Cohen will race me to her room because they are just as smitten with her happy morning face. But this happy baby wasn't always the case a few months ago. When Remy was a few weeks old, we noticed she was spitting up a bunch, had hiccups all the time and was crying more than usual. It broke my heart to see her so fussy but as a mom of three it was also tiresome because the only thing that kept her content was when you would hold her -- standing up. I didn't realize this but baby colic is pretty common. Every 3 out of 10 babies may eventually suffer from it! Now, Remy was never diagnosed with colic, but she did have several symptoms of it. The biggest one was the excessive crying, especially during the evening and night hours. It was exhausting, but we learned a few tricks to help us manage and get through it! 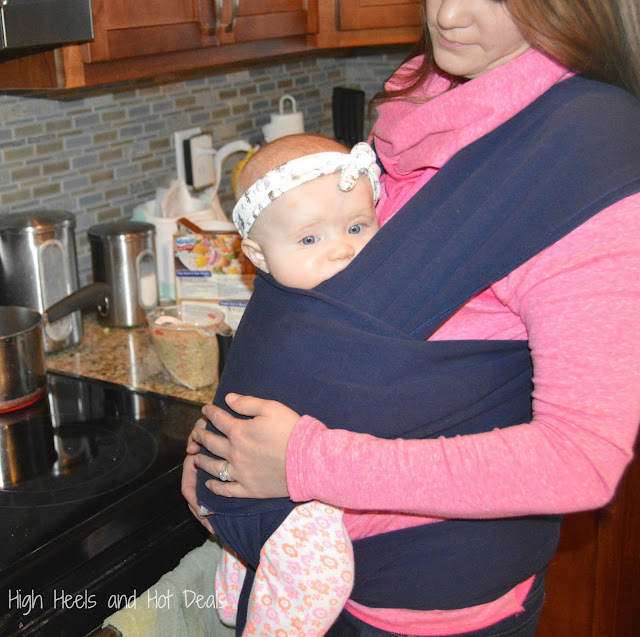 I'm not sure why I didn't use a baby carrier with Cohen, but with both Lola and Remy it has been a life saver! As soon as Remy would start to get cranky, I would put her right in the carrier and hold her next to my chest. The closeness to me helped soothe her and she would either calm down or even fall asleep. I found that after I would feed her and lay her flat on her back, she'd start to get fussy. We kept Remy in the Rock 'N' Play by our bed until she was four months. The inclined sleeping position helped settle her tummy after feedings and she was a lot less fussier when she slept in this. After every 2 ounces I would stop and burp Remy. Usually she would be madder than a hornet that I was stopping her feeding but the less bubbles we got her tummy, the happier she would act. We started to cut back on this the older she got and now at almost five months we can feed her the entire bottle and burp her at the very end with little problems. 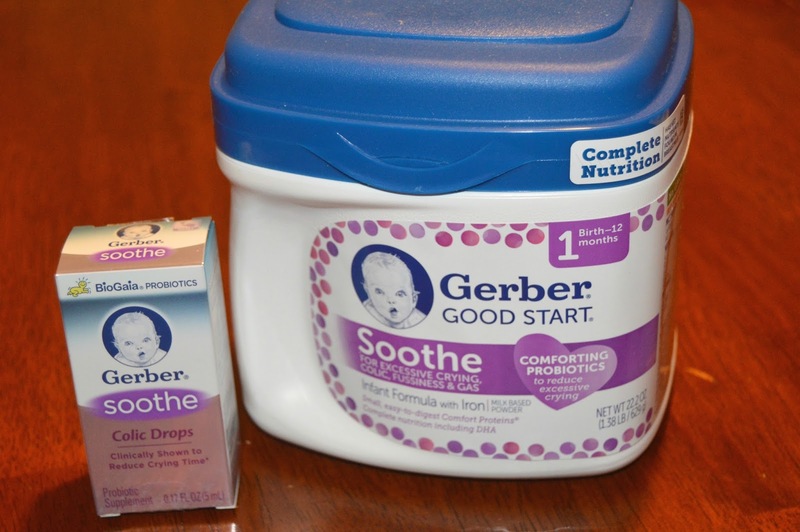 GERBER® Soothe Colic drops and the GERBER® Good Start Soothe Infant Formula. This line of products was designed for excessive crying. The GERBER® Soothe probiotic Colic Drops contain a healthy probiotic (L. reuteri) that is naturally found in breast milk. It has clinically been shown to reduce the crying time in colicky breastfed infants. The GERBER®Good Start Soothe Infant Formula was specifically designed to ease excessive crying, colic, fussiness and gas all while providing complete nutrition for your baby. Eventually we were able to move past this fussy, colicky period as Remy got older. Life became more manageable as well as enjoyable because she was no longer crying 23 out of the 24 hours a day. I also felt more at ease because I could actually play games and do activities with Cohen and Lola without bouncing a crying baby in my arms. While we will occasionally have a fussy period or two, I now have things I can do to make her feel better. Do note that The GERBER®Good Start Soothe Infant Formula and GERBER® Soothe probiotic Colic Drops is a routine infant formula and supplement probiotic - it is not intended to treat or cure any diseases. 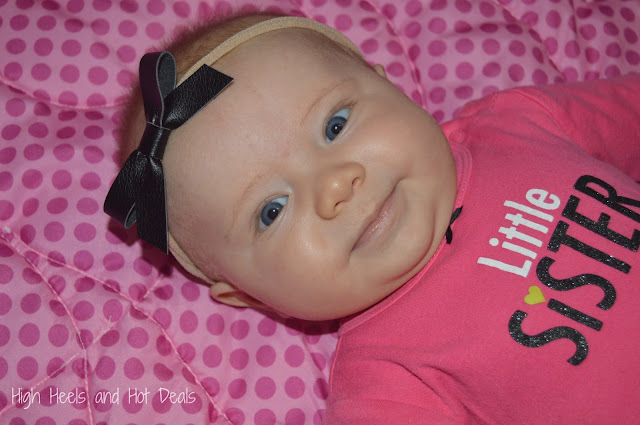 Did your babies have colic? What were your tricks to help soothe your fussy babies? Purchase GERBER®Good Start Soothe Infant Formula and GERBER® Soothe probiotic Colic Drops on Amazon today!